Masterpiece Robot pays tribute to the power of a child’s vivid imagination, which can transform a suburban autumn backyard into a futuristic battleground and Laura’s lively siblings into unwitting but enthusiastic participants in a fight for a planet’s survival. We begin in Laura’s bedroom where she is struggling to find her way into the story she wants to write, and we end there with Laura putting the finishing touches on her triumphant tale. When Laura―a.k.a. Masterpiece Robot―heads into the backyard with her little sister Molly―a.k.a. Sidekick―her active imagination places them instead on patrol around the perimeter of a dystopian city, guarding against super villains. Then older sister Amber―a.k.a. Valerie Knick-Knack―throws handfuls of fallen leaves at them, unknowingly initiating a battle for the ages. The transitions back and forth from suburbia to dystopia in this story within a story are deftly rendered with contrasting palettes. The rollicking interactions of the sibling heroes and villains make Masterpiece Robot pure fun to read. As far as book genres go, comic books aren't normally my thing. But I was interested in the premise of Masterpiece Robot: And the Ferocious Valerie Knick-Knack, and decided to read it along with my granddaughter, Rahjae. A story within a story, Masterpiece Robot is packed with comic book panels of a family playing together in the leaves and of superhero children battling villain, Valerie Knick-Knack. It takes the powers of Laura (aka Masterpiece Robot), her sidekick Molly, and Roman (aka Lord MekMek) to bring down Valerie Knick-Knack. This story ultimately shows that a child's imagination during free play can be used to concoct adventures and escapades. The kids playing in the leaves weren't doing just that; They were also imagining what it would be like to be superheros. Masterpiece Robot is a book recommended for kids aged 7 to 10. Rahjae is eleven years old and enjoyed reading the action-packed adventures. There are a handful of words that I had to explain to Rahjae because they were unfamiliar to her but, other than that, Masterpiece Robot is an entertaining, fast-paced story. 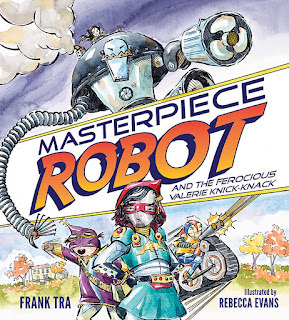 One person will win a hardcover book copy of Masterpiece Robot. Captain America is the best superhero but Bucky Barnes AKA Winter Soldier is my favorite. Wonder Woman is my favorite super hero. My favorite superhero has always been Spider Man,I love the way he can swing from building to building. Evie from Sarah Kuhn's Heroine Complex books. After Infinity Wars, it seems like they're all dead.... I'll go with Wonder Woman. In a comic book my son Isaak was reading there was a character named Zeek. That's what I call Isaak. I'm going with that. I thought it was so cool I saw his nickname in a book. Wolverine is my favorite superhero and favorite comic book character. My son and I both love Superman. He's a classic super hero! Superman was my favorite growing up. I always liked the bionic women. I like Wonder Woman the best. My favorite superhero is Batman! i love the incredible hulk. it's my favorite. I don't have a fave, but my daughter is into those Dogman books, he's a superhero so I think she would love this. My favorite is Wonder Woman. My favorite superhero is Superman. I always liked Wonder Woman.